much food as possible from local farms, farmers markets, and our own garden, and as little as possible from grocery stores. I am so frustrated with the way our country’s food industry works. Like everything else, its all about the money. Cheap, unhealthy ingredients, and a lot of them is what you will find in most processed convenience foods. My grandma recently tried to buy a package of frozen fish at the store and put it back on the shelf when she saw it came from china! My mother-in-law recently saw on the news that there are 30% fewer nutrients in our foods now than when she was growing up. Large industrial farms are more concerned with the look and size of their food than the quality. Food on grocery shelves with few ingredients and healthy, natural ones are few and far between! Its so sad to see. Its no wonder I see young people come into our chiropractic office unhealthy, overweight, and on multiple medications. They are a product of our society today and the food most readily available and affordable. I imagine my generation and those to come will not live as long as my grandparents generation. There is just too much intervention ruining our food, and most in the name of money. Now that I have ranted for a while, and I could go on for pages, I’ll move on to the good stuff. In my mission to obtain farm fresh foods and without breaking the bank, I have decided to start with meat and dairy (which we don’t eat a lot of), the foods highest on the food chain and most likely to be contaminated. 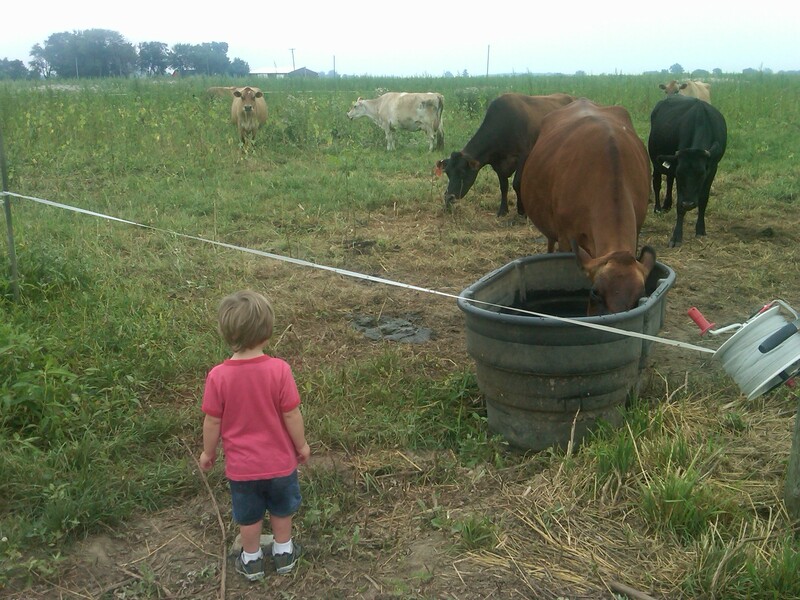 I was so happy when I received an email from friend and fellow mom, Kate of Modern Alternative Mama, inviting me to join a group of local families ordering meat and raw milk from an Ohio farm. 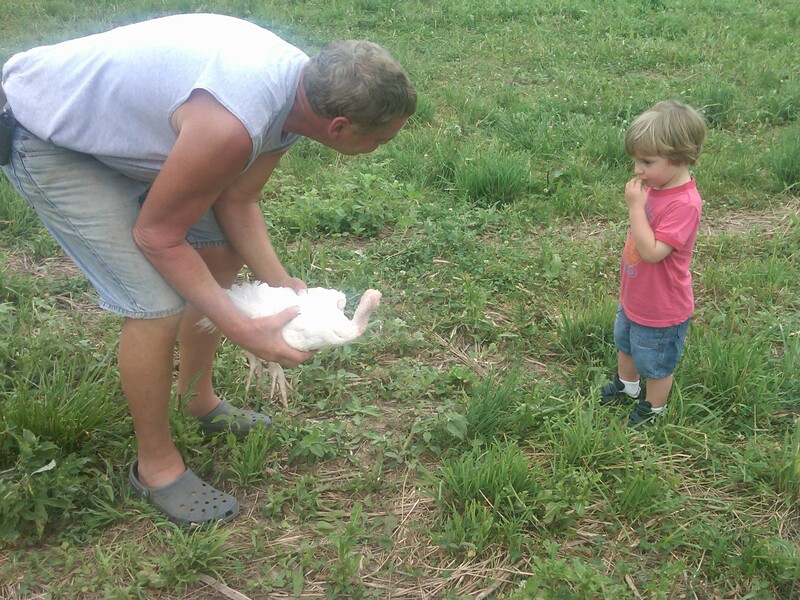 The farm is Luginbill Family Farm. For any family’s in Northwest Ohio, Columbus, or Dayton, I highly recommend Luginbill. We have had a wonderful experience so far and have enjoyed quality meats and eggs at affordable prices from a family farm. We have tried eggs, chicken, turkey, and beef. The eggs are huge, and a challenge to crack open and obviously from a healthier chicken. My husband wonders if the grocery store eggs could even capable of hatching a chicken. Last month we tried a whole chicken and enjoyed 2 meals of white meat and then froze the remaining chicken pieces for later and boiled everything else to make 8 cups of stock! I am planning on trying their raw milk soon too! In addition they have lamb, and many cuts of beef and pork. Kate toured the farm and interviewed the farmer before organizing the ordering group, but recently we made our first trip to the farm to do a pick-up! We enjoyed a tour of the farm. 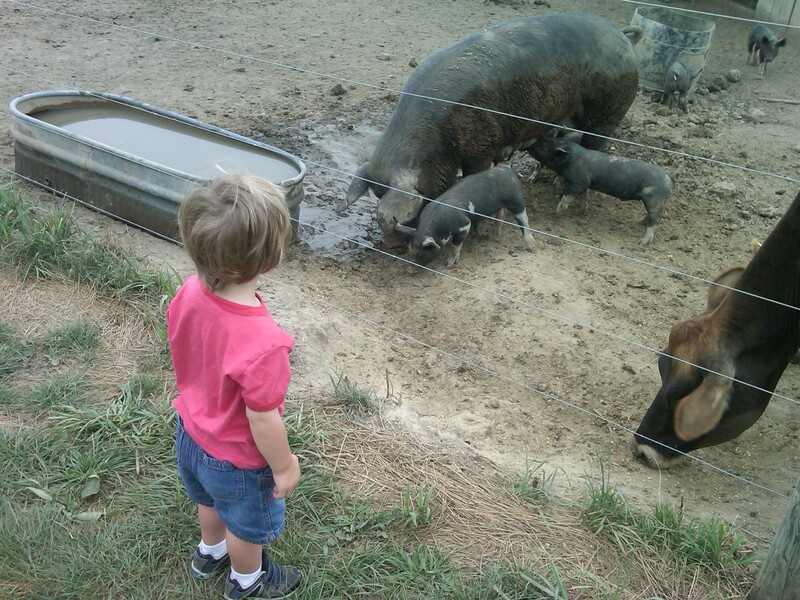 Jack had a great time watching the animals! If you are local and interested in joining our ordering group let me know. The prices are on the farm’s website. If we get enough people in our group, the farm will deliver to Columbus. 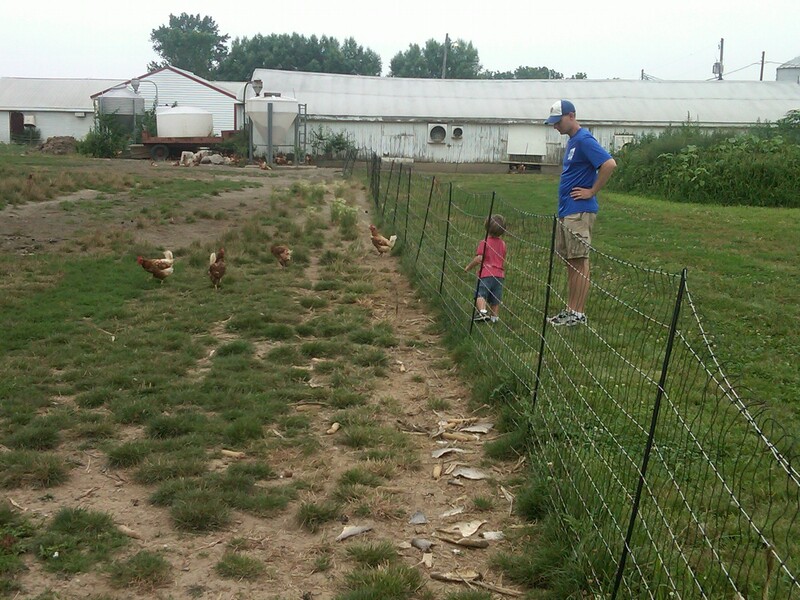 Visit the farm – personally meet the farmer and take a tour of their farm. You will be able to see first hand how they care for their animals and quality of food and have an opportunity to ask them any questions you have. 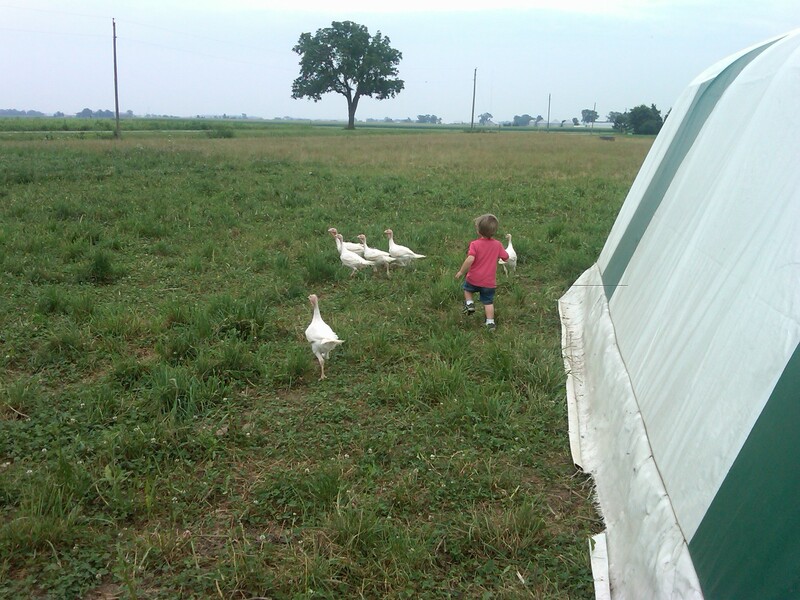 Look for a farm that is either certified organic, in the process of getting certified, or who follow organic practices. Some smaller farms may not have the resources to get certified but are as organic as any other certified farm and often have more affordable prices and offer more of a personal experience. Ask if they will be able to keep up with your needs, and do they have a variety of offerings to suit your family’s menu. How local are they and are they willing to deliver? The closer the farm, the more “green”! If the farmer is delivering from a far distance, you and the environment may be paying for the fuel costs. Have you tried a local farm? Have you noticed a difference in the quality of food?